For several years, I have been very eager to facilitate Passion Art Projects loosely based on Google’s Genius Hour. I explained to the students that we actually attend a school that is named after a great inventor, Alexander Graham Bell Elementary School and since he (among others) invented the telephone, the phone has gone through serious design transformations…all created by industrial designers, a type of artist/inventor. There are a lot of wonderful resources online. Also, a good friend of mine, Lincoln Park High School art teacher, Ms. Grimm shared some of her project resources with me. This helped me frame my vision and teaching strategy. I taught the lesson for the first time today and already made changes to the brainstorming think-sheet, slide show and creative expectations. The best character trait of any teacher is to be flexible. Exploring, researching and attempting this project has required patience, reflection and constant tweaking. The three main rules of the Passion project/Genius hour are: Create something, research it and present! Bell 5th graders will be the first group to leap into this new venture this year. As presenting their work is the final step, this blog post will become a gallery where they can add their descriptive, fact based topic paragraph and a photograph of their Passion Invention project for all to see! Families will be notified of this exhibition gallery and will be able to add approved comments that I can later share with the students. To help connect the ideas of invention, history, design and storytelling, I asked the students to compare two different flying inventions, one by Leonardo Da Vinci, ca.1485 and the other one by Abbas Ibn Firnas, ca.875. It was interesting to see the students trying to figure out which invention had been invented first. They were also surprised the Firnas invention was from ca.875, close to 600 years BEFORE the Renaissance and Da Vinci! They were also surprised to learn that while the era before the Renaissance in Europe is called the Dark Ages, in fact, in the Middle East, this could not be further from the truth. The Dark Age in Europe is considered the Golden Age in the Middle East, a time filled with mathematical, scientific, artistic and creative inventions, many of them later influencing European, inventions 400 and 500 years later in Europe such as astrolabes and surgical devices. Much of this information was transferred via the Silk road through accounts of merchants and sailors meeting Muslim traders in “penny universities.” Google has created a spectacular website documenting the early, Golden Age inventions and contributions by female and male creators here. To learn more about these fascinating, trailblazing Golden Age inventors, students watched and discussed the 1001 inventions initiative, award winning video called “Library of Secrets.” They learned about Firnas and other Golden Age thinkers whose inventions are still used in the modern world today! Topics picked by my first group are: Help the World clay model, Help the World art design kit for children with no art, ocean cleaning device, poster to raise funds for homeless people, build a sculpture of a restaurant that offers free food to homeless people, “The E project” a graphic novel, design and write a song book about problems in the world (pollution/war/homelessness/healthy choices/save the animals,)”Don’t be selfish poster to help the homeless, Royal Python painting, Dogs Can Fly invention (inspired by Firnas/Da Vinci,) Free food cart, handmade bowls at the free food cart, Stop Poverty poster, build a sculpture of a free apartment building for the homeless, Comic book to help people learn to read, Bangtan band painting/album cover. Topics picked by my second group are: Arm sculpture model for people without arms, A Cubs W sign design, A poster called “Come out of the Dark” as an album cover about feelings, fancy soccer ball, Super Speed skateboard, Mini Coral Reef, Doll Friend, Scale City Model, Bird, Snowball game character sculpture, Film trailer, Baseball Bat sculpture, PacMan Game model, Cubs Team 12 month calendar, Electric Car sculpture, Cubs Mascot bobble head sculpture, Help Earth jewelry, Queen Tribute album cover. Welcome back to school everyone! We are all excited to be back in the art room! Our theme this year as we develop our artistic thinking is that we can all build on our mistakes as we are all Works in Progress. Student artists and I are shocked that we are already in the 5th week of school. I send out a warm “hello” to my 3rd, 4th and 5th grade artists who I will not be able to work with until 3rd and 4th quarter. The art room misses you! The first week of school, students read and discussed author/illustrator, Kathryn Otoshi’s meaningful childrens’ book: One. I had the pleasure of meeting Ms. Otoshi at a Facing History and Ourselves event last spring. During Otoshi’s presentation, she discussed the importance of using simple yet meaningful terms to help children develop social and emotional skills to navigate life as kind, empathetic humans. Her primary concern is the assumption that all kids at recess are doing just fine but that often, the open end play at recess can be the toughest part of the day emotionally for some students and to remind children of their agency as friends to all peers, that every 1 counts! She explained a residency she participated in at a school district in California where she presented the One story. Next, her students created projects based on One and as whole schools took vows to be the “One” who is inclusive, stands up against inequality and is kind. She then created school wide hand prints which were added to a “One/Kind” bird which would hang in the schools as a permanent reminder. With Otoshi’s permission, I lovingly borrowed her bird idea. Each Bell student with art 1st quarter contributed a hand that will be added to the “One/Kind” bird that will hang at Bell. I currently have some 6th graders helping me build the bird with 100s of beautiful hands! The work will also be inspired by the new public art, Phoenix Rising by Lucy Slivinski, a recycled metal phoenix sculpture standing at the corner of Broadway and Montrose. Students discussed how the phoenix is a powerful symbol for all of us as we enter a new year, a clean slate, ready to transform. Pre-Kindergarten to 8th grader artists are digging into their own work, trusting their expression, applying visual art skills and developing perseverance when they meet struggles. Here they are caught in the flow! Pre-Kindergarten Deaf students are practicing American Sign Language (ASL) colors matched with the actual colors they are using as well as learning how to mix primary to secondary colors. Later, they will begin mixing their own primary and secondary color landscapes. Kindergarten students in all departments are also practicing ASL colors. I support the use of ASL in the art room as much as possible. For the past 3 weeks, students have reviewed and shared their ASL color knowledge with a lot of excitement. Currently, Kindergarten artists are honing in on their shape drawings and learning how to distinguish between abstract and realistic portraits in preparation for our upcoming abstract and realistic self portrait projects. Also, during the last 7-10 minutes of each class, I allow students to “free” draw. This allows them to explore their own ideas, expressing what is on their mind in that moment. First Grade artists in all departments are practicing colors using ASL. They are also reviewing color mixing by creating their own color wheel which they will refer to during first quarter. We have read Ellen Stoll’s Mouse Paint to help reinforce this color mixing in a silly way by watching the mice dance as artists to make their own secondary colors. We refer to the popular OK Go color mixing video: “There Are Three Primary Colors” and students love to get up and dance out the color mixing to help them remember. Students will then design a random, overlapping line drawing therefore making multiple unique shapes they then can color in with primary, secondary and tertiary colors. Students love mixing their own custom colors, counting out the shapes they made themselves and exploring all the textural ways to use oil pastels in each shape! They came up with some awesome new color names: Will called his yellow—golden nugget, Townes called his red—lava, Avery called her purple–blushed purple, Rory called her pink–piggie, Maxine called her blue–blueberry, Thalia called her red–lipstick, Forrest called his blue–coolblue, Eli called his pink–coconut, Flynn called his pink–bubblegum and Trevor called his green/orange–Brazil. Second Grade artists are finishing up an Exquisite Corpse project inspired by Surrealist art, comic books and the Chicago Imagists /Harry Who. The name Exquisite Corpse was coined by Surrealist artists to describe a form of art made by multiple artists, like a drawing filled with details that are unexpected, many parts pieced together like Frankenstein. Incidentally, The Hyde Park Art Center, The Elmhurst Art Museum and the Northwestern University’s Block Museum ALL have Chicago Imagist/Harry Who shows up now! Hope you can get out to catch their amazingly wacky, unexpected artwork at these three shows. Random repetitive mark making, use of onomatopoeias, collaborative drawings and color blending bring these quirky, whimsical 2nd grade Exquisite Corpses alive! Sixth grade artists are busy sharpening color pencils, smudging graphite sticks, designing balance in compositions, playing with foreground/background and buddy checking each other’s Sketchbook drawings for creativity, carefulness to detail, vibrant color and/or blended value scale and thorough consistency and completeness. Each student has two assigned and two choice sketches they are planning. We have studied Wassily Kandinsky’s, Improvisation 30 (Cannons) and students use viewfinders to hone in on the section of Cannons they choose to draw 3X the scale. The second assigned drawing is a highly detailed drawing of a shoe. Students are at first apprehensive about setting their shoe on the table but later love being able to draw in their socks! While working on the shoe drawings we consider thoughts like…who made our shoes? How did they get to the store? Where will they go when I am done with them? Where do they take us? How are our shoes connected to our identity? Seventh grade artists have headed back in time and are taking us down their path of converging lines into their world with linear, one point perspective. Students discovered how to interpret the depiction of space in a Medieval era painting made before the wide use of linear perspective during the Renaissance. Some art historians believe the Egyptians and Romans had already discovered this illustration technique to draw depth in space but during the Renaissance, the use of these devices changed art forever across Europe. Students are just starting their drawings now and are encouraged to create unusual, expressive environments around their linear perspective landscapes. To inspire imagination students have critiqued work by painter, Alexis Rockman (who recently had an exhibition at the Chicago Cultural Center) and graphic designer, Vinicus Costa who are known for Sureal, high detail features that suggest other worlds, sometimes sweet, sometimes spooky. 8th Grade artists are applying their budding knowledge of the Universal Declaration of Human Rights and are applying these rights as they view and critique the documentary film called Wasteland, which documents contemporary artist and UNESCO Human Rights Ambassador, Vik Muniz as he travels back to his home country of Brazil and collaborates with garbage pickers (Catadores) in Jardim Gramacho, which was the largest garbage dump in the world at the time. It has since closed to make room for the Olympics and the World Cup. Students have just begun their artist response pieces showing the hardships, highlights of transformation and joy Vik and the Catadores share while making art and selling these highly valuable “trash portraits” at the high art dealer market, then taking the money back to their community to help their colleagues with education, safety and security in their Rio favella. Students question what the role of “helper” and “choosing to participate” means when helping a less privileged group. How long and how much is enough? How do we make contact? I have contacted the film maker, Lucy Walker and we plan on sending notes/questions and pictures of our art projects to the Catadores we can find online! In honor of the Alexander Graham Bell Elementary School Centennial Anniversary, in preparation for the year long festivities honoring the long and valued history at Bell School, art students are creating Hopes and Dreams Intention drawings showing what they desire to see in the world in the next 100 years. Their earnest care and concern comes through. Check them out! There are too many to add all of them here but we will keep updating this post and scan more as the weeks pass by. Also, they will be displayed in the school during the school year. To generate ideas, students were led through a envisioning process, hearing stories about Chicago and Bell School over the past 100 years, what students their age lived through: the tail end of WW1, The Depression, WW2, The Civil Rights Era, Feminism, NASA, the Hippie Culture, The Vietnam and Korean Wars, Desert Storm, 911, Climate Change, Gender Equity and so many more. We discussed the struggles in society and how families found safety and security having a strong place like Bell School to return to each day during the 100 school years. Our halls are filled with 100 years of hopes and dreams. Please download it and create one and bring it to the Bell School Alumni Celebration Day on March 4th. There will be 8th grade students there to discuss and involve you in their 8th grade Legacy Project Installation, “You Can Change the World.” They will be prepared to give you very personal and specific information on just how they believe you can indeed help change the world via little and BIG steps. That there is no poverty. That bugs, trees and plants will be here in 100 years. Fourth quarter, the Bell artisan centers continue as students have continued with exploring the complicated and beguiling angles and patterns of 4 fold symmetrical designs. Prior to drafting their own 4 fold symmetrical design, Kindergarten to 7th grade students’ jaws dropped when they watched the step by step process explained by Eric Broug in his TedTalk video. Later, after they had finalized their drawings and began embellishing the repeating shapes with colored paper inlay, similar but by far easier than the traditional tile inlay found in Marrakech; students were very proud of their drafting skill– shocked that they were capable of successfully drawing what seemed so complicated at first. We thank Eric Broug for this helpful video! His website has a lot of resources too! Check out the intricate work of our amazing students! These tile designs connect Bell students to the more than 1000 year old history and techniques of these designs which can be found from Marrakech, Morocco to Alihambra, Spain. The tessellated patterns transcend our everyday life and allude to an eternal and universal order found in the predictable yet very mystical and awe inspiring repetition of geometric shapes, some very common (octagon), yet when repeated and overlapped, transform in to vivid, gripping and moving designs. Visit Bell School on June 8th to see the walls lined with 900 of these stunning and carefully crafted art works. As an installation, the feeling of the walls will hopefully transport us to the patterned walls of Moroccan homes, mosques and schools. Check out some patterned tile photos Mr. Danja and I photographed last summer in Marrakech. Imagine having a wall or stairs singing color and pattern as seen in these photos! How would that change your feelings? How would the patterns inspire you on a daily basis? Think about it! Thursday, March 24th, 6th graders from all three departments viewed Moroccan trained, ceramic drum builder, Heather McQueen demonstrate hand-building and drum skin stretching techniques in preparation for their Moroccan, Tarija drum making unit. Below, you can see Heather sharing her very small Tarija with 6th grade student, Katarina. Heather brought a variety of drum examples to share with the students. She did an incredible job explaining the process of hand-building the drums step by step. 6th grade students are excited to begin the project in the next few weeks! We are hoping to bring Heather back to our Moroccan themed, Family Fine Arts Night on June 8th. We will have donated cylinder materials students can turn into drums that night so they can join in on drumming circles inspired by the nights events. 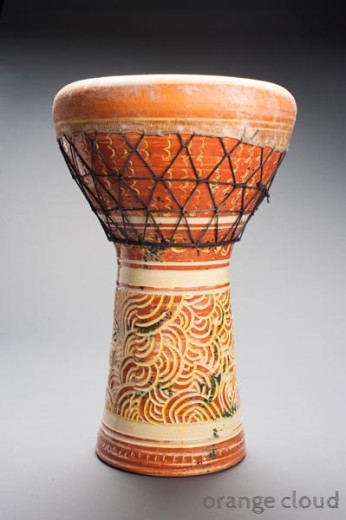 As Heather mentioned, wherever in the world there is clay and leather, you will find cultures who hand build clay drums. 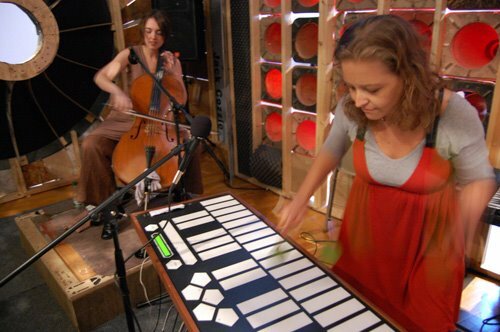 Humans have been making music using voices for songs and found and forged natural materials for close to 50,000 years. Take a peek at the earliest known drum below, a 37,000 year old, elephant skin drum. Every family in Morocco has some form of a percussive object at home and if they don’t have a formal tarija, they often look for any household object that can create and project a vibration such as metal tea trays (Often used in the female bands called Laabat), a solid wood table edge (very common), spoons hit on tea glasses (carefully)! Many gatherings involve spontaneous music and these chances become energetic and multi-generational, impromptu performances that lighten any mood on most days. Lesson learned, make more music with friends and family and most likely, your troubles will be lessened or fade away completely! Tarijas are used primarily in the poly-rhythmic musical circles in the Tkah singing style. This is a very interactive, call and response style of singing that includes comments and familiar rhythms to all involved and is well known in Moroccan communities. Below see a photo of Heather showing different types of drum skinning. We thank York Chan, Bell Tech extraordinaire for helping us use a document camera to project Heather’s demonstration and record it for future review. Heather taught us how to use toilet paper rolls as cylindrical forms to make the tube of the Tarija and a vessel mold for the round part of the drum. She also taught us how to glue on the skin top and introduced us to her experiences working with drum makers in Meknes, Morocco since 2005. Heather is a very talented ceramist. This photo below shows her incredible skill at forming large scale, ceramic vessels and her experimentation with glaze colors in impressive. Heather mentioned that much of her ideas for glaze combinations come from her watercolor and sketching. Notice the images and how they relate to the glaze samples she keeps in her studio. Before Heather left for the day, she had some extra time to visit the enthusiastic kindergartners in room 211. Students were delighted to show their handmade vessels and play Heather’s drums! Thank you to Heather for your informative visit. We hope to collaborate with you in the future. Also, thank you to Sarah Hoppe Knight, Chicago Foundation for Education Program Director for stopping by to support our Moroccan programming. All of this work would not be possible had Arabic Teacher, Mr. Danja at Lane Tech and Ms. Pearlmutter not been awarded a Fund for Teachers Fellowship to research art and music and storytelling in Marrakech, Morocco during the Summer of 2015. We are so grateful that so many students and families are still being impacted by this research. 900 so far at Bell and the Arabic students at Lane Tech! Make sure to return to Bell on June 8th for drumming, Moroccan music, an Oud performance, Moroccan inspired artwork set up in an old world, Moroccan souk with live artisans giving demonstrations. Making Drums!! Check it out!!!!!! Last week, the 6th graders started making their tarija drums in art class! We will continue to update this post as more images from the process become available! BONUS! Heather was generous with her time and answered some questions we sent to her to learn more about her inspiration as a ceramicist. Ms. P: Why did you originally start making drums? Ms. P: Where do you like to find your clay? H: My favorite place to see clay? In the caves! (I am a recreational cave explorer) I know of potters who dig their own clay, but I get mine from the nice people at Chicago Ceramic Supply, located in Evanston. Ms. P: Do you feel Moroccan clay is different from American Clay? Here is Mr. Danja (Lane Arabic teacher) softening the clay in an ancient technique that has been used for centuries! Feet can do amazing things! Here is Ms. Pearlmutter with a potter friend in the village of Tameslhouht surrounded by ceramic tajines, couscous platters and pitchers. The ceramicists work in a cooperative. More on that soon! Ms. P: How did you end up learning Tarija drum making in Morocco? H: I was already making doumbek/darbukka drums (the larger Middle Eastern hourglass-shaped drum), which is not all that common in Morocco. So in theory, I knew what to do. I learned the musical style called “Aissawa” which uses the Tareja a lot. That’s where I began to realize the potential it holds as an instrument, despite its small, unassuming size. Ms. P.:How did you meet the artist there? H:I was introduced by another American friend who had spent time in Meknes. Ms. P: What is your fondest memory of drum learning/making in Morocco? H: Seeing how happy my teachers were to see their culture shared, and to have people come from all over the world to visit them and appreciate their craft. Ms. P: What is your favorite song that comes to mind that uses your drums? Ms. P: Can I find a link for it on You Tube? And a group of Moroccan Aissawa playing similar… I tried to locate Baba Jalil and the group from Meknes, but can’t find a video of them with Tarejas. So here’s one, and it includes another goblet-drum called gwall. A little unusual to see it in this combo, but the ‘percussion orchestra’ idea comes across. Ms. P: How do you think drums can affect people, places, energy, community, etc? H: They connect us at our core- across language, age, culture, disability. They have the power to lift our spirits, give us joy and heal our souls and bodies! Ms. P: Anything else you would like to add? H: It never stops! I love where this craft has taken me- from Morocco and Chicago, onto the radio, through the UK, national television and more… and now your school! In preparation for the 8th Grade Legacy Project, a collaborative mural made each year as an annual showcase of culminating 8th grade artwork at Bell School; on March 14, visiting artist, Chicago based, Juan Angel Chávez presented his portfolio of sculpture and installation work. Mr. Chávez commented on his early experiences of immigrating to America from La Junta, Chihuahua, Mexico and the challenges he and his family faced due to that experience of dislocation. He shared his experiences of creating street installations out of re-purposed materials that he found in the urban environment. The city and built environment becomes an aesthetic palette for him as he splices and fuses unexpected objects, curves and bends plywood, incorporates old signs, reflective cake pans, wires and lights. His explanation of the interactive, Speaker Project which he installed at the Hyde Park Arts Center in collaboration with the Empty Bottle was very inspiring. He designed a beautifully patched together room that featured sound making inside and used orange safety cones to project the sound. He described that visitors were invited to engage in sound making and become apart of the actual sculpture through performance and responding to others in the installation. Learning about this piece inspired ideas for incorporating Bell student interaction with sounds connected to the Legacy Project for this year. News on that to come! The other project that related well to the Facing History and Ourselves curriculum connecting 8th grade Bell students to issues of identity, choosing to participate, universe of obligation and social and cultural dilemmas and awareness was Chávez’s installation titled, Neptuno. In this piece, he constructed a passageway that suggests the hidden smuggler tunnels taken by Mexican immigrants who travel between two worlds near the border, Mexico and America. The title “Neptuno” relates to a song Chávez heard playing often in Mexico which suggests that when Mexicans make the journey to America, that they not act or look like they are from Neptune when they are from the border, that they assimilate their identity to their American surroundings. In this video, Chávez discusses his inspiration. 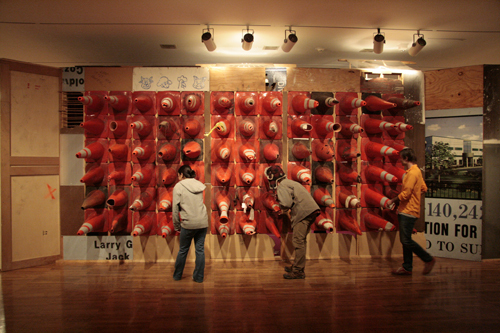 Linking his assemblage style to the 8th grade students makes more sense in some of his wall installations. Disparate pieces are joined in whimsical and texturally interesting ways. Rippling curves become lichen, shadows play into the overall design and the juxtaposition of sizes and edges come a live. Thank you Mr. Chávez for sharing your vision with us! All Bell students have begun working on various art centers inspired by the Moroccan research from last summer. Inspired by the tboga lesson with LaFatima in Ludaya, a village near Marrakech, students began reinterpreting the ancient art of basketry by using magazine and catalog pages. They are folding, gluing and carefully shaping their re-purposed magazine vessels while also forging the ancient and universal basket design element of the spiral. Students were fascinated to learn that the simple spiral in the tboga and many other ancient baskets follows the Fibonacci sequence. The next center will involve students cutting, braiding, hand crocheting and fashioning utilitarian objects using plastic yarn =plarn. Students will be able to create any object as long as it serves a purpose from this material. The third center opening soon will be that of an exploration into Eastern Design inspired by the intricate geometry of Islamic Symmetrical Designs tile designs. Students will explore the main styles of symmetry and design their own colored paper mosaic inspired by the design styles. This year, Mr. Busse and Ms. Pearlmutter have led the 5th to 8th grade students in a warm up reading and sketching session at the beginning of each art class. This process helps warm up the students’ left side of the brain while they are able to explore drawing materials on a new page of their sketchbook. Each week, during their drawing session, we read a new page from the incredible book, Radical American Women, A-Z. So far, we are on F for Florence Griffith Joyner. 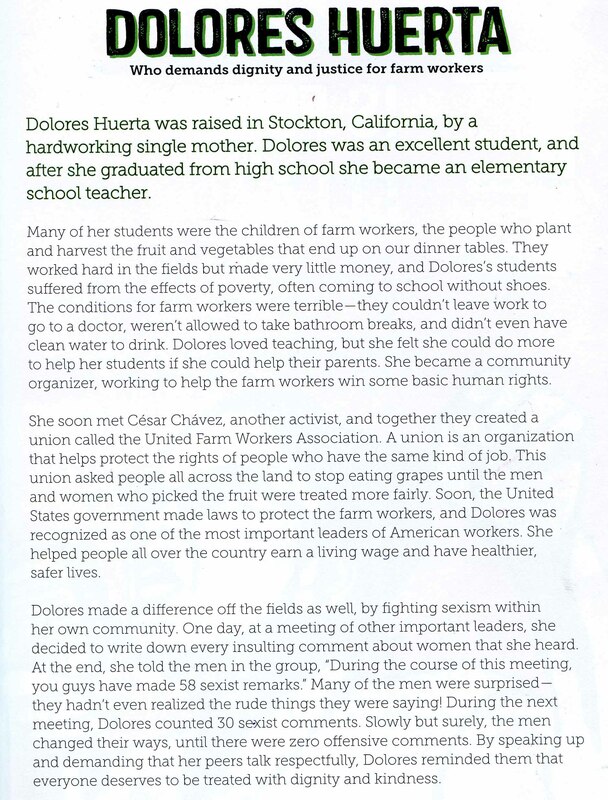 A recent eye opener of a biography that grabbed the hearts of the students was for Delores Huerta. Although we had heard of her, we did not realize the multiple ways her vision and work had impacted Americans. Check it out. In response to the weekly readings, we write a word on the board and the students have the choice of creating a drawing in response to the topic or draw from their own imagination. Here are some of the profound pages we have encountered. They are many hanging in the hallway near the art room. Stop by to check out the Bell Sketchbook Reflections! This summer, Ms. Pearlmutter and her husband, French and Arabic teacher at Lane Tech, Mr. Danja traveled to Marrakech, Morocco to conduct research of storytellers, artisans, musicians, storytellers and Non-profit organizations. They spent 42 days in artistic workshops, collaborating with incredibly bright students writing stories, making videos and exploring cross-cultural ideas and citizenship. This year the students at Lane and Bell will be given the chance to learn the artistic and communication skills we learned. So that you can learn more about our exciting, learning adventure and read wonderful comments written by our Bell, 6th grade and Lane, Arabic 1-4 students, please visit our blog. Trusting children with building materials is a key step in bolstering a child’s identity as an inventor and artist. Whether made of tape, paper or used wrappers transformed into a home, a bridge or something with no name at all, young artists develop a hands-on understanding of balance, weight, volume, three dimensions and permanence. As they construct, students learn about stretching time and as they are in the flow of making important sculptural choices while building, they loose track of their surroundings and can get completely taken over by their creation. This type of involvement strengthens the right and left brain hemispheres. As spring and summer break approach, Bell art teachers encourage our families to set up a safe tinkering station in your home. Consider starting with simple tools like a tape measure, scrap paper, twisty ties, found objects, masking tape and glue. Later, when students are older, introduce hot glue and an adult monitored–low voltage, hand held drill, screws, nails and a hammer. Contact local carpenters to ask if they have wood scraps you can pick up, save popsicle sticks and corks. Get some sand paper so they can learn how to treat the wood with care before their sculpture is built and painted, or not. Take a walk with your young artist and pick up treasures you find cast off as trash but would make great art. Started in 1967 “to explore how children and adults learn in and through the arts,” Project Zero at Harvard University, has made huge strides in researching the links between cognitive development and hands-on problem solving. They host learning conferences, artists in residence, research and online library of resources. Here are some interesting articles to read regarding their work: Mind/Shift and Project Zero Programs. The Exploratorium in San Francisco is an interactive museum focusing on tinkering, experimental inquiry, science and experiments. They wrote two engaging books, Explorolab and The Art of Tinkering. Check them out! Artist, Scott Weaver expresses the joys of tinkering in this informative video. Many tinkerers have changed the world. Lenoardo DaVinci had volumes of materials he collected in his studio to bend, stretch and nail into a flying machine or robotic knight prototype. Rube Goldberg was multi-talented. He was a cartoonist, engineer and visionary. Who else would try to problem solve how to create a machine that can pull the cotton out of an asprin bottle? Although he did not build his inventions, his drawings show an incredible amount of original thinking. Another brilliant and lesser known group of tinkerers is the French sculptural, husband and wife team, ACM, which stands for Alfred and Marie Corinee. They have been known to fuse together discarded machine parts, fuses, feathers, sticks, sprockets and more. Check them out! We are fascinated with the variety of textures, layering and colors ACM blends together. We have several videos and websites we suggest to inspire a home of tinkering and building. Remember not to aim for perfection but to allow the process of making, falling apart and restructuring with important building decisions to be the focus. Families who create together can do amazing things. Please let us know if you create a Tinkering station in your home and share pictures too!